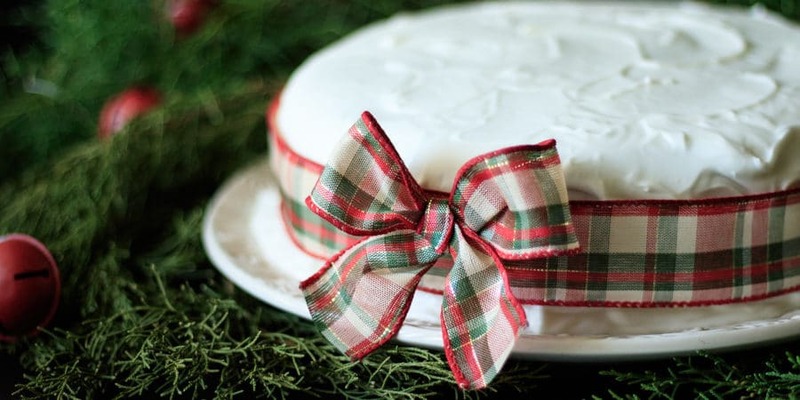 Learn how to decorate a round Christmas cake in the traditional British way. The apricot jam, marzipan, and royal icing will transform your cake into a showstopping Christmas centerpiece! In my family, we’ve always enjoyed our Christmas cake without any decoration. This year, however, I wanted to try the traditional British way of decorating a round Christmas cake: with marzipan and royal icing. It might seem unnecessary to have a sweet icing on an already rich cake, but the icing actually complements the cake and adds another beautiful texture to the mix. I love the subtle almond flavor from the marzipan, too! 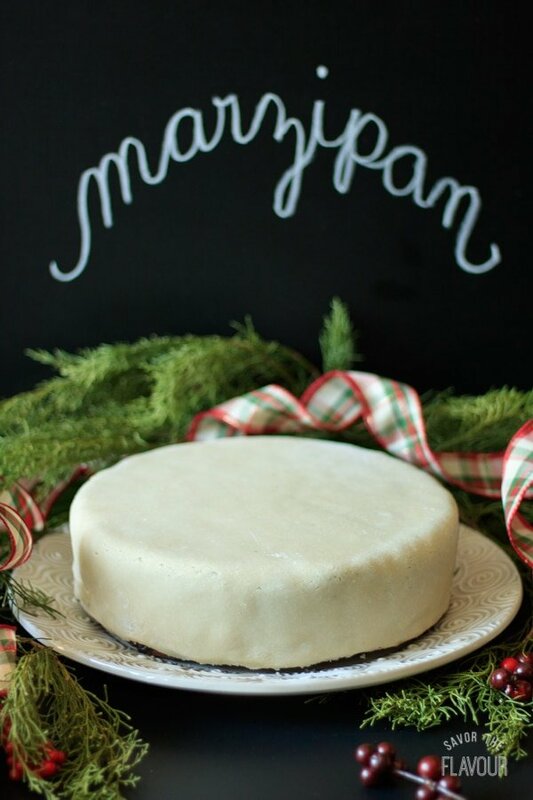 Besides turning your Christmas cake into a eye-catching showstopper, the icing, marzipan, and apricot jam seal in the moisture of the cake and help preserve it for storage before it’s cut. Once it’s sliced, keep the cake covered with plastic wrap, then foil, and store in a cool, dry place. Freeze leftover cake by wrapping it in plastic wrap, foil, and placing in a freezer bag. It can be frozen for up to a year! 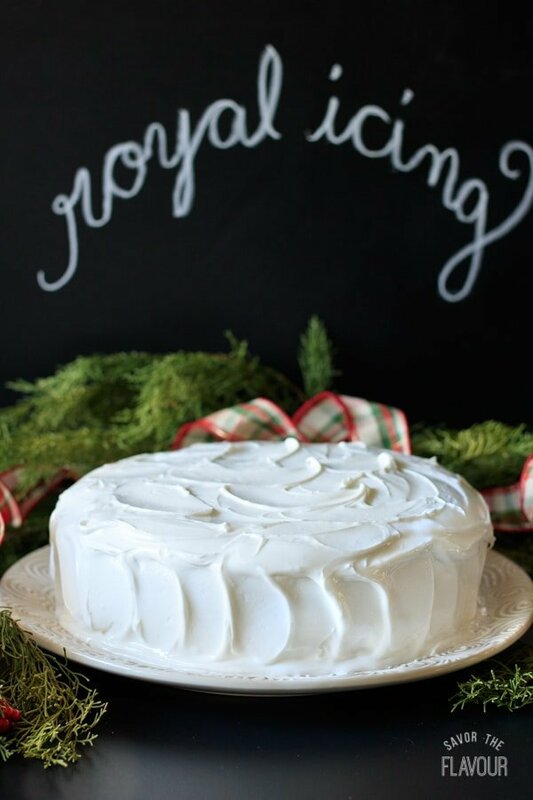 If it’s your first time making royal icing, there’s no need to worry–it’s not as hard as it might seem. The lemon juice cuts the sweetness of the icing a little, and the glycerine keeps the icing somewhat soft when it’s dry. No one wants a cement coating on their Christmas cake! 😉 Look for glycerine in the cake decorating section of your local arts and crafts store or online. 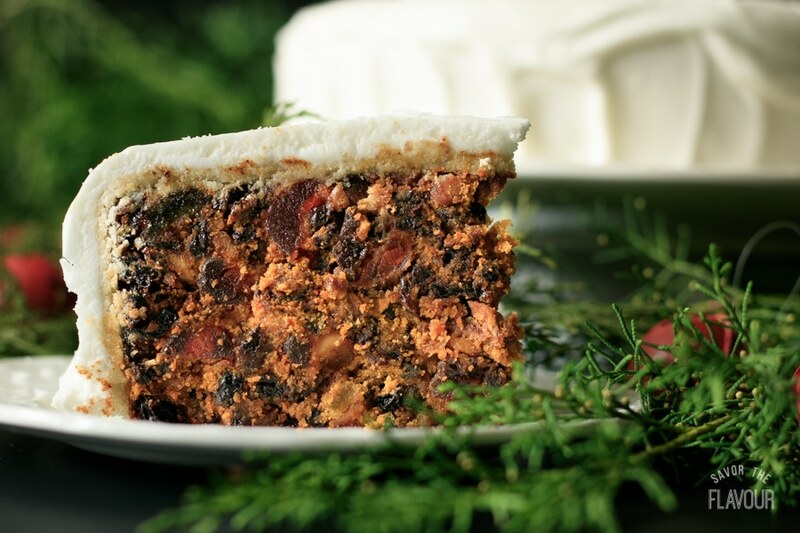 If you need a recipe for Christmas cake, check out this moist, classic recipe here on Savor the Flavour. Ready to give this a go? Make sure to start 1 week before you want to serve the cake, as the marzipan and icing need time to dry before serving. Don’t worry–it’s worth the wait! Take the aged Christmas cake out of its tin and remove the lining paper. Place it flat side up on a large serving plate. Warm the apricot jam in a small saucepan with a splash of water, stirring frequently until the jam has melted. Push the jam through a sieve with a spoon, reserving the sieved jam. Brush the jam all over the flat top and sides of the cake. On a surface lightly dusted with icing sugar, roll out the marzipan in a circle a few inches larger than the cake. Roll the marzipan up on the rolling pin, then lay it on the cake and smooth the top and sides. Trim off any excess marzipan and patch any places where the marzipan didn’t reach. You’ll probably have leftover marzipan, so just save that for another use. Loosely cover the cake with parchment paper and set it in a cool, dry place for 4-5 days, until the marzipan has hardened. Place the egg whites in a clean, grease-free bowl and beat on low speed with a hand-held electric mixer until they are foamy and frothy. Add in the icing sugar by large spoonfuls while whisking on low speed. If the mixer’s motor is struggling, increase the speed a little. Once all the icing sugar is incorporated, whisk in the lemon juice and glycerine and whisk on medium speed until the icing stands up in stiff peaks when the whisk is lifted. To test the icing further, place a generous blob of it on a flat surface. If the icing holds its shape, it’s done. Use the icing immediately, or cover with plastic wrap and keep in a cool place until needed. Spoon all of the icing onto the top of the cake and spread it evenly over the top and sides, giving it a snowy look with a small spatula or palette knife. If you’d like smooth icing, use a ruler or palette knife to smooth it. Leave the cake uncovered in a cool, dry place for 2 days for the icing to set. Once the icing has set, wrap a festive ribbon around the cake. Make a small bowl out of the same ribbon and pin it onto the cake. Serve the cake sliced in very thin wedges. Make sure to take a small piece of Christmas cake, as it is quite rich. You want to save room for other Christmas baking! Keep leftover Christmas cake covered with plastic wrap in a cool, dry place. Avoid storing it in an airtight plastic container, as it will make the icing weep. To freeze Christmas cake, wrap it in plastic wrap, then aluminum foil. Place the wrapped cake in a freezer bag and freeze for up to 1 year. I have 2 kids and I would like to know if the egg whites aren’t cooked, what might happen. You say they are going to be dried but I am just afraid they won’t be cooked. Any solution please? There is a slight chance of salmonella in raw eggs. Fortunately, you can use pasteurized egg whites or meringue powder instead of the raw egg whites to negate the chances of foodborne bacteria. Here’s an article showing you how to pasteurize eggs: https://www.thespruceeats.com/pasteurize-eggs-in-the-microwave-995505 Hope this helps!